If you're just joining us, this is the second of two Photoshop tutorials on how to enhance your photos, especially portrait shots, using a soft glow effect which not only softens the overall image but also helps to smooth skin, boost contrast and enhance colors, all at the same time. There's a couple of ways to create this effect in Photoshop, both of which can be completed very easily. Both ways can also give you great looking results. The key difference between them is that one produces a static effect, meaning that it can't easily be changed or edited later, while the other remains fully editable even after the effect has been completed, allowing you to go back, make changes, and see if you can improve the results even further. In the first of these two tutorials, we learned how to add a soft glow using the more basic and traditional method (the static method) that's better suited for beginner Photoshop users. It gave us great results but it didn't let us go back and make further changes or improvements. In this tutorial, we'll learn how to create the exact same soft glow effect while keeping it fully editable from start to finish, and we'll do that by taking advantage of Smart Objects and Smart Filters. Smart Objects and Smart Filters may be considered more "advanced" features in Photoshop, but don't let that fool you. As we'll see, they're every bit as easy to use as normal layers and filters, with the added benefits of being extremely flexible and completely editable without any loss in image quality. As always, I'll cover everything step-by-step, explaining things as we go so that even if you're new to Photoshop, you can easily follow along. If you haven't done so already, I encourage you to work through the first tutorial, Easy Soft Glow Effect In Photoshop, before moving on to this one since this tutorial will occasionally mention steps that were covered previously. This time, because we'll be keeping the effect fully editable, what we need to do instead is convert the Background layer into a Smart Object. What's a Smart Object? Think of Smart Objects in Photoshop as containers that hold layers, and converting a layer into a Smart Object is like placing the layer inside one of these containers. The containers are transparent so we can't actually see them, which is what makes Smart Objects a bit confusing at first. What we see in our document is not the Smart Object but the layer inside the Smart Object. Smart Objects are very flexible. In fact, many of the things we can do to a layer, we can also do to a Smart Object. The important difference, though, is that when we edit a Smart Object, that's exactly what we're doing; we're editing the Smart Object itself, not the layer. In other words, we're editing the container, not what's inside the container. The layer inside the Smart Object always remains safe and unharmed, and that's what makes Smart Objects so flexible and editable; no matter what we do to a Smart Object, Photoshop always has that original, unedited layer inside of it to go back to. Clicking the menu icon in the Layers panel. The Layers panel showing the new Smart Object icon. Smart Objects have plenty of uses on their own, but one of the best reasons for converting a layer into a Smart Object is that is allows us to apply Photoshop's filters to the layer as Smart Filters. 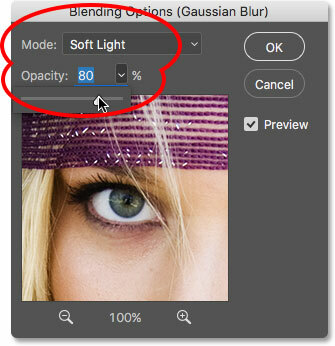 In many ways, a Smart Filter is just like a normal filter in Photoshop. In fact, there's no difference at all between filters and Smart Filters when it comes to choosing them or using them. What makes Smart Filters so "smart" isn't what they can do; it's what they can do after what is is they've already done! To show you what I mean, let's apply Photoshop's Gaussian Blur filter to the image, just like we did in the previous tutorial. This will soften the photo, creating the first part of our soft glow effect. The only difference is, this time, we'll be applying the filter not to a normal layer but to a Smart Object. This opens the Gaussian Blur dialog box. Just as before, the idea here is to soften the image by blurring it without going so far that we make our subject unrecognizable. We control the amount of blur using the Radius slider along the bottom of the dialog box. The further we drag the slider to the right, the stronger the blur appears. Photoshop gives us a live preview of the effect, so keep an eye on your image as you drag the slider to judge the results. Adjusting the amount of blur with the Radius slider. So far, there's really been no difference in how we've applied the Gaussian Blur filter from the way we did things in the previous tutorial where we created a static version of the soft glow effect. In both cases, we selected Gaussian Blur from under the Filter menu in the Menu Bar, we used the Radius slider to adjust the strength of the blur, and then we clicked OK to close out of the dialog box. Yet this time, somehow, we've managed to apply Gaussian Blur not as a normal filter but as a Smart Filter. How did we do that? Smart Filters are listed below the Smart Objects they’ve been applied to. If you remember from the previous tutorial, the next step we needed to do after blurring the layer was change its blend mode from Normal to Soft Light. This is what turns our "blur" into a "glow". Problem is, in that tutorial, we had a separate, independent blur layer sitting above the image. This time, we don't. All we have is our Smart Object with a Smart Filter applied to it. So how do we change the blend mode? 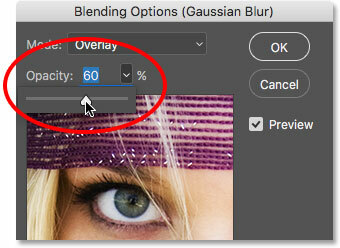 Double-clicking the Gaussian Blur filter's Blending Options icon. Changing the blend mode of the Gaussian Blur filter to Soft Light. The image after changing the Gaussian Blur’s blend mode to Soft Light. Changing the blend mode from Soft Light to Overlay. The image with the Gaussian Blur filter set to Overlay. To reduce the intensity of the glow, simply lower the opacity of the Gaussian Blur Smart Filter. 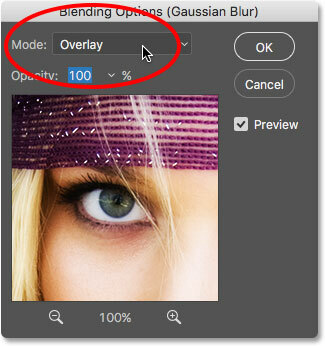 You'll find the Opacity option directly below the Blend Mode option in the Blending Options dialog box. Lowering the opacity of the Smart Filter to 60 percent. The image using the Overlay blend mode, 60 percent opacity. Setting the blend mode back to Soft Light and raising the opacity to 80 percent. The soft glow effect using the Soft Light blend mode, opacity at 80 percent. So far so good, yet here we are near the end of the tutorial and we still haven't seen anything special about Smart Filters. Sure, we were able to change the blend mode and the opacity of the Gaussian Blur filter, but as we saw in the previous tutorial when we created a static version of this effect, we could have done the same things using a normal layer. What's so "smart" about Smart Filters? What makes them smart is that, unlike normal filters in Photoshop, Smart Filters are completely editable. Now that I've been staring at my image for a few minutes, what if I start thinking,"You know, maybe a stronger blur amount would look better." 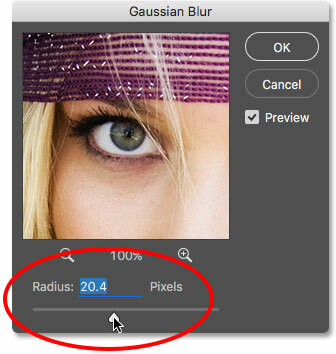 I'd like to go back and change the radius value in the Gaussian Blur dialog box. If we had created the effect using the more traditional method without Smart Filters, there would be no easy way to do that. I'd have to either start over again, or at the very least, undo all of my steps to get back to the point just before I applied Gaussian Blur, which may or may not even be possible depending on how many steps I've done since then (Photoshop only lets us go back so far). Double-clicking on the words "Gaussian Blur". Editing my original setting by increasing the radius value. Click the visibility icon to toggle the Smart Filter on and off. The final, edited soft glow effect. And there we have it! That's how to enhance your images with a soft glow effect and keep the effect fully editable from start to finish using the power of Smart Objects and Smart Filters in Photoshop! Check out our Photo Retouching section for more Photoshop image editing tutorials!